Create a Project and add a member to the Project. 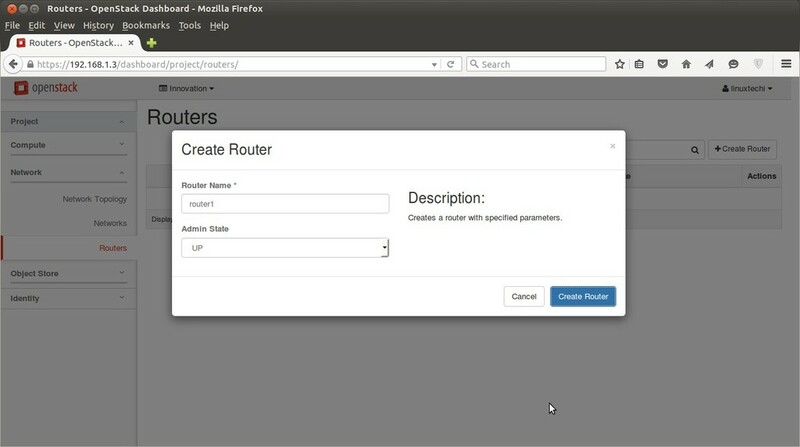 Create a Network and Router for a Project. In my Case i will use Project Name as “Innovation” and linuxtechi as Project Member of Innovation. 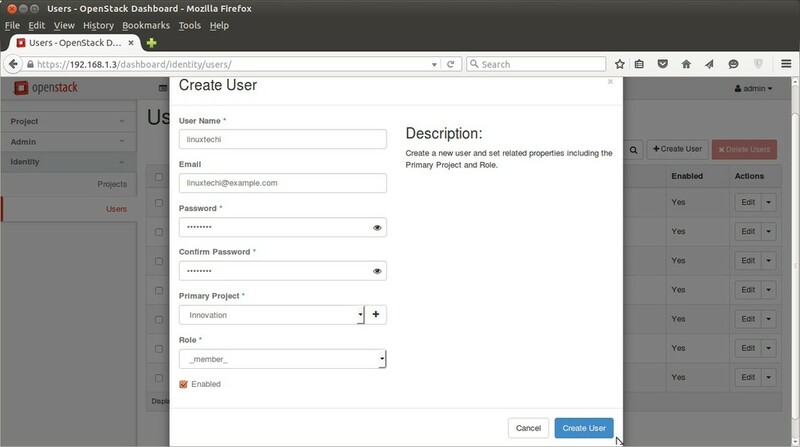 Login to the dashboard using Admin credentials and Go to Identity Tab –> Projects and Click on Create Project. 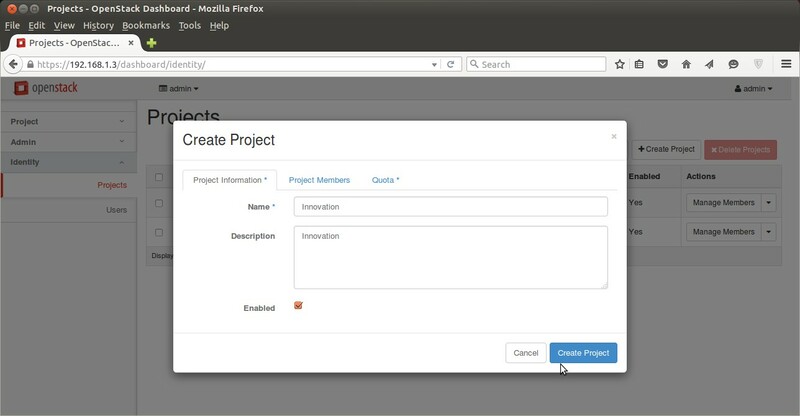 Click on “Create Project” , We can also set the Quota for the project from Quota Tab. To create a flavor login in dashboard using admin credentials , Go to Admin Tab –> Flavors –> Click on create Flavor. 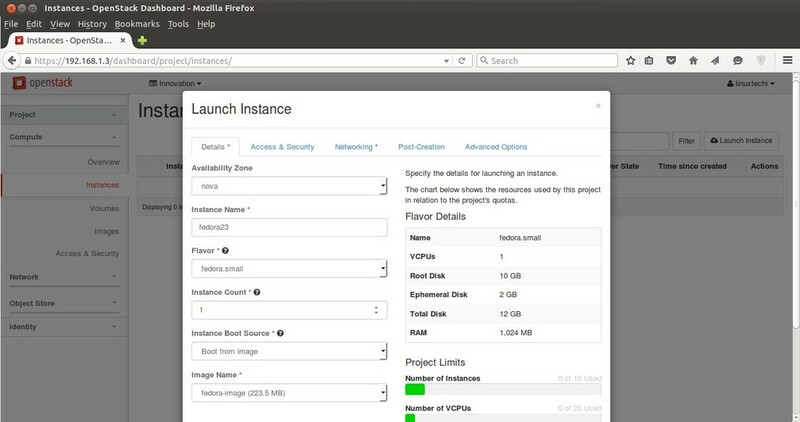 Specify the Flavor Name (fedora.small) , VCPU , Root Disk , Ephemeral Disk & Swap disk. To Create Image , Go to Admin Tab –> Images—> Click on Create Image. 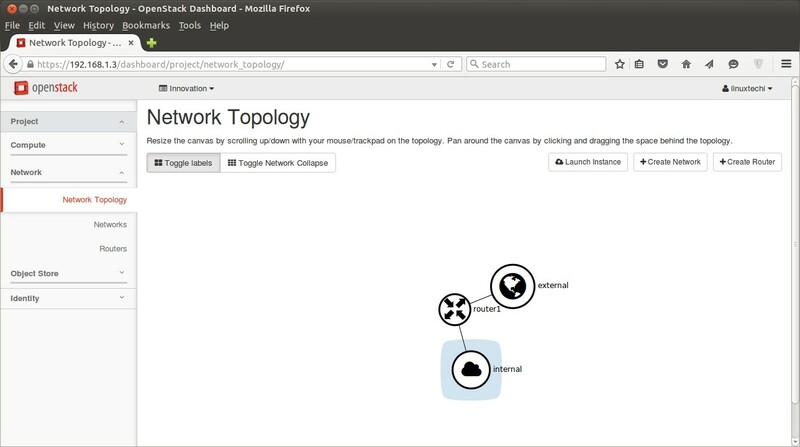 Create Network and Router for Project Innovation. 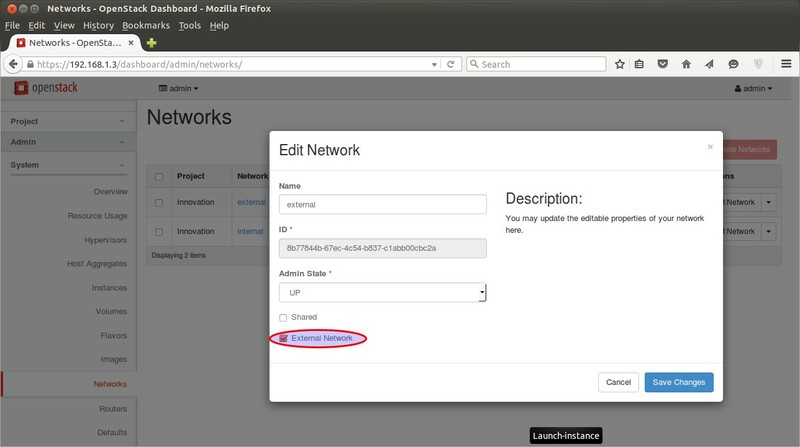 To create Network and router for Innovation project sign out of admin user and login as “linuxtechi” user in dashboard. 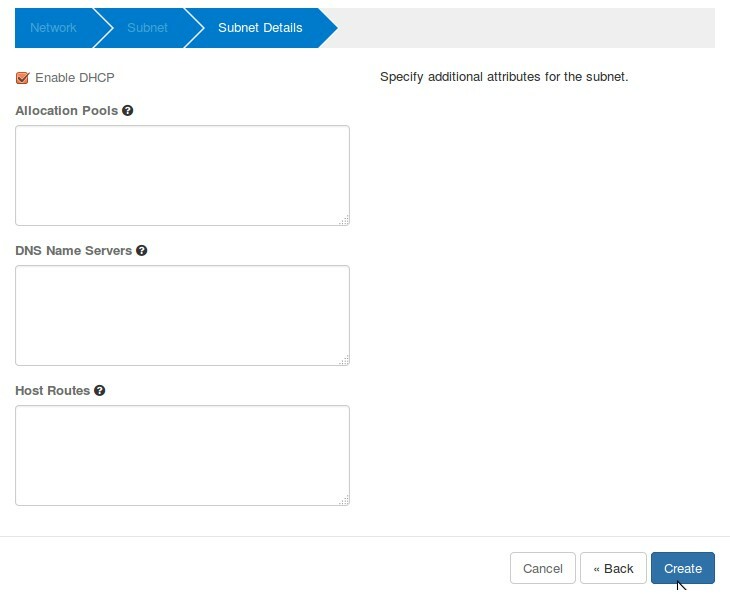 VMs will be getting internal ip from DHCP Server because we enable DHCP option for internal network. 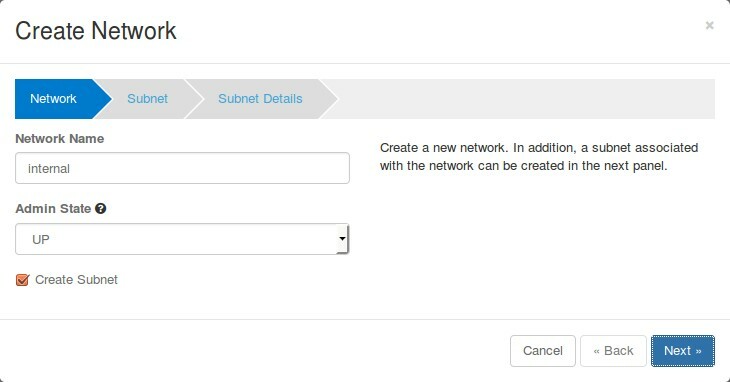 Untick “Enable DHCP” option and Specify the ip address pool for external network. Now time to create a Router. 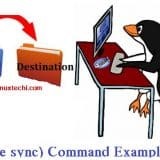 Now Mark External network as “External” , this task can be completed only from admin user , so logout from linuxtechi user and login as admin. 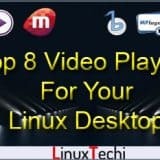 Now Logout from admin user and login as linuxtechi user. 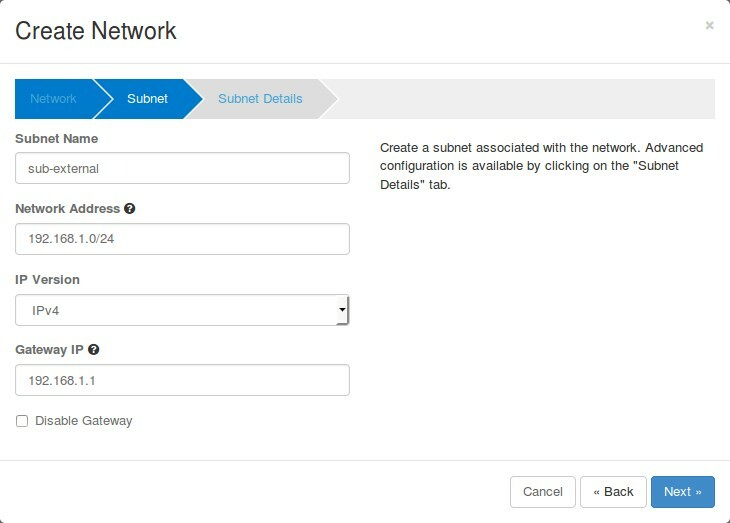 Click on “Set Gateway” , this will add a interface on router and will assign the first ip of external subnet (192.168.1.0/24). 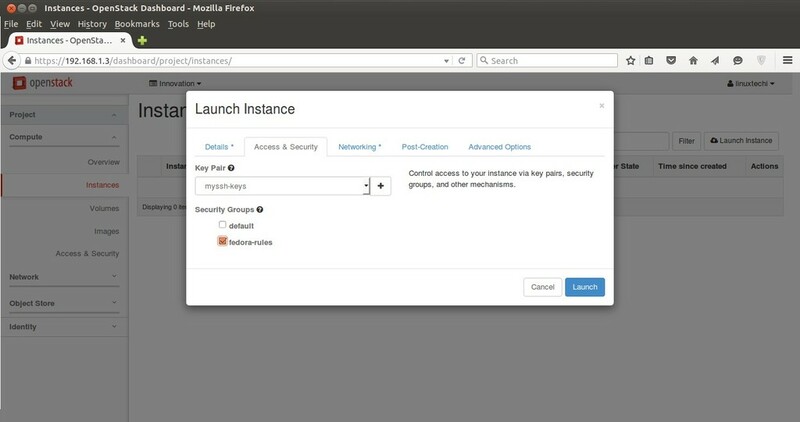 Now Create a key pair that will be used for accessing the VM and define the Security firewall rules. 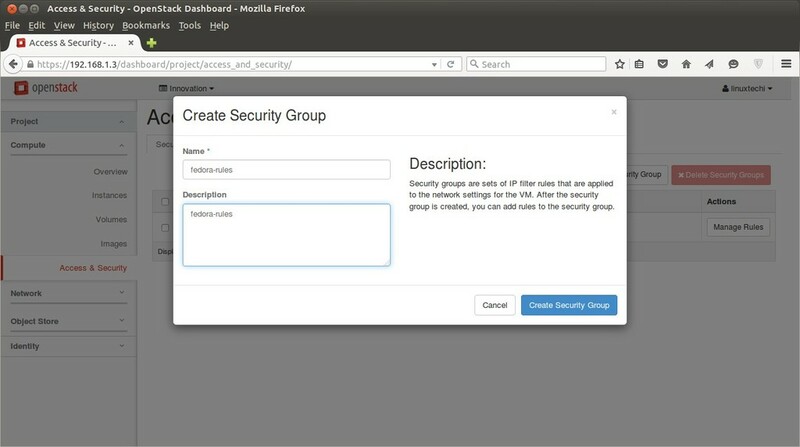 Add a new Security Group with name ‘fedora-rules’ from Access & Security Tab. Allow 22 and ICMP from Internet ( 0.0.0.0 ). 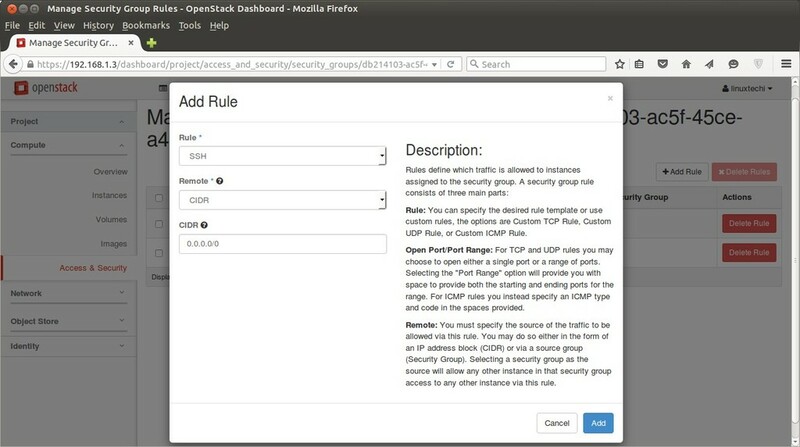 Once the Security Group ‘fedora-rules’ created , click on Manage Rules and allow 22 & ICMP ping. 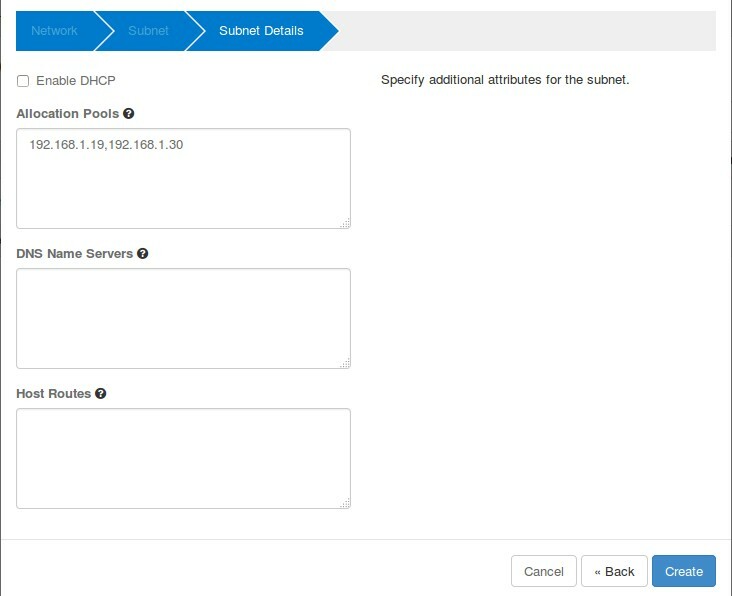 Click on Add , Similarly add a rule for ICMP. Now Finally it’s time to Launch an instance. 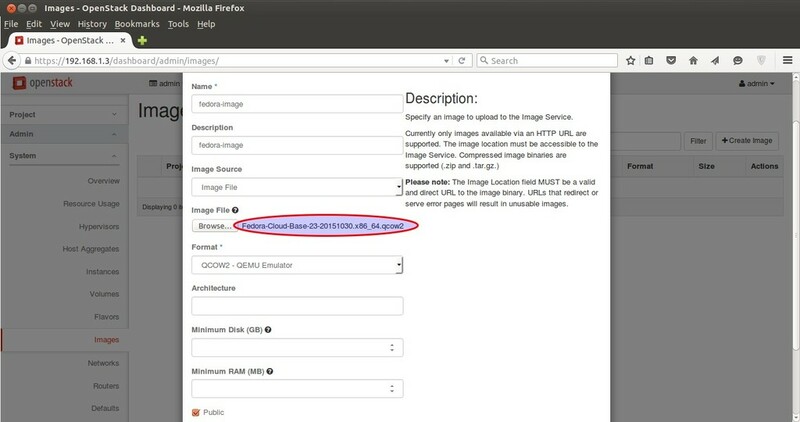 Specify the Instance Name , Flavor that we created in above steps and ‘Boot from image’ from Instance Boot Source option and Select Image Name ‘fedora-image’. Now Select Networking and add ‘Internal’ Network and the Click on Launch …. 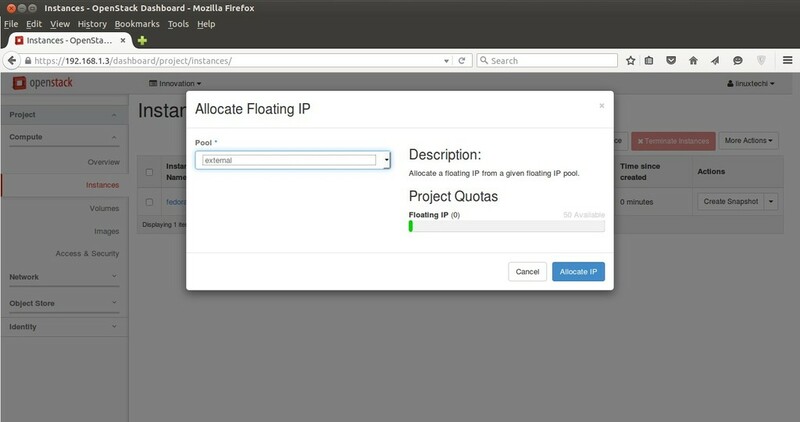 Once the VM is launched , Associate a floating ip so that we can access the VM. 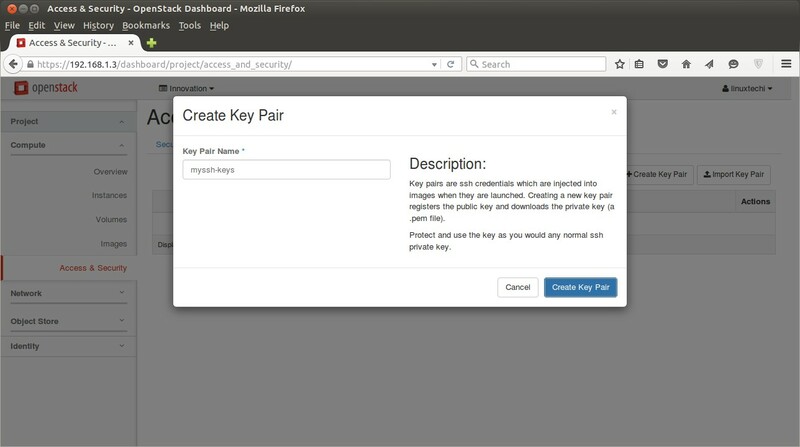 Now try to access the VM with floating IP ( 192.168.1.20) using keys. 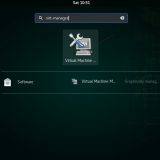 As we can see above that we are able to access the VM using keys. Our task of launching a VM from Dashboard is Completed Now. Hope you like steps and do not hesitate to share this article. Thanks for providing such a wonderful step by step guide for bringing up instance. 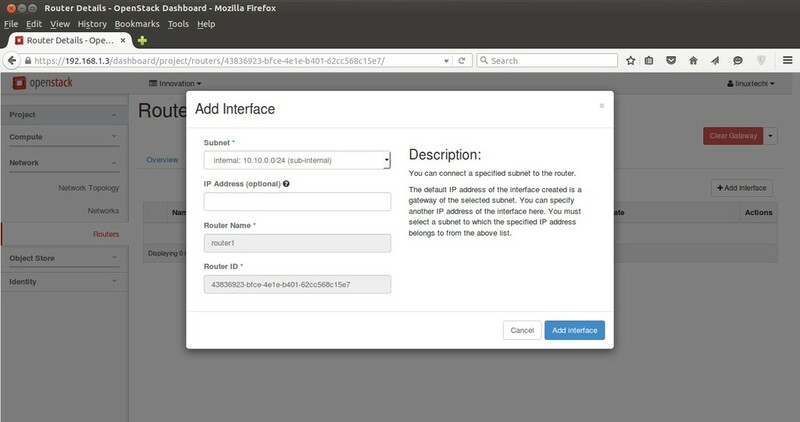 Have tried to bring up the same fedora image provided here with virtual box. My virtual box has interface with ip 192.168.56.103 and dashboard is being accessed using this ip inside virtual box. 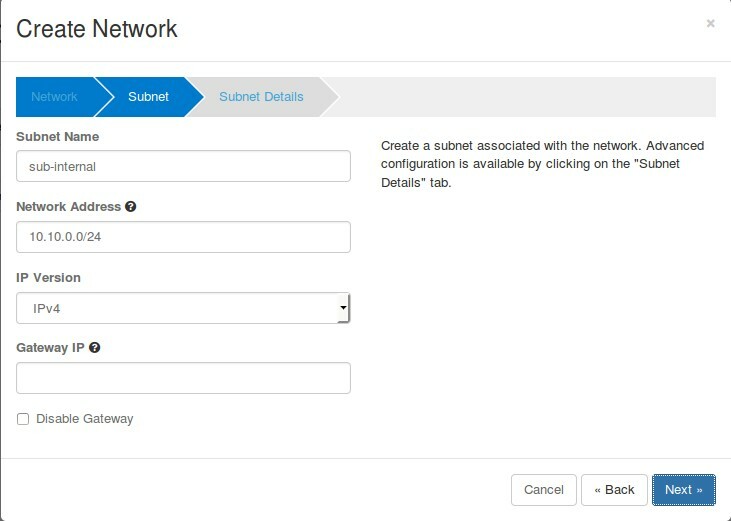 Now, I brought up the instance by following the steps mentioned and my instance associated floating ip which is allocated from the external pool as 192.168.56.51. When I tried to ssh 192.168.56.51, getting no route to host error. It would be great help if you provide any input on this. 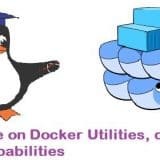 Have you configured Security firewall rules for the VM ?, by default SSH port is blocked. Thanks for your reply. I have not configured it, could you please give me a pointer on how to do it? 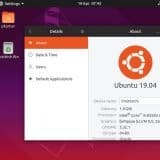 I am using windows as host machine and guest as ubuntu wily server (Installed devstack on ubuntu server). 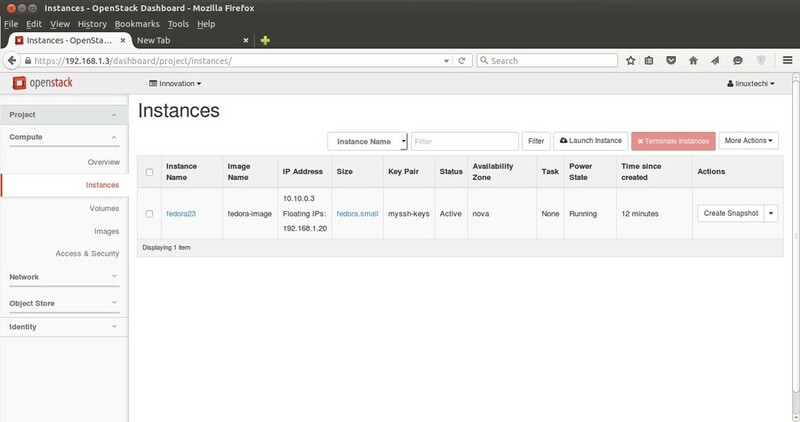 I have installed Openstack Mitaka using three nodes: Controller (IP Address: 192.168.100.62), Compute (IP Address: 192.168.100.63) and Networking Node (192.168.100.64). I have followed your website to do the installation and then network bridging. After successful installation I have followed above steps to create project, user, image, network and router. At last I have created an instance successfully. After creating instance, I am able to access the instance from the console on OpenStack Dashboard. It would be great help if you provide any input on this. Please provide you email address if possible. 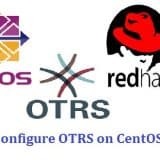 I follow this post for installing all-in-one Liberty on CentOs7. Error: Unable to retrieve volume limit information. I checked with Liberty2 and Liberty-3 , I got error in both cases. Did you encounter this error ? if you are getting error Unable to retrieve volume limit information . then you have to increase the number of virtual cpu(vcp if you are installing inside vmwrae workstation or vmware ESXi). The openstack requires a lot of CPU resources. 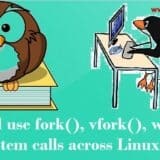 Definitely your error will remove if assign a more cpu to compute node. Thanks for sharing the instructions. I followed the document and installed openstack. 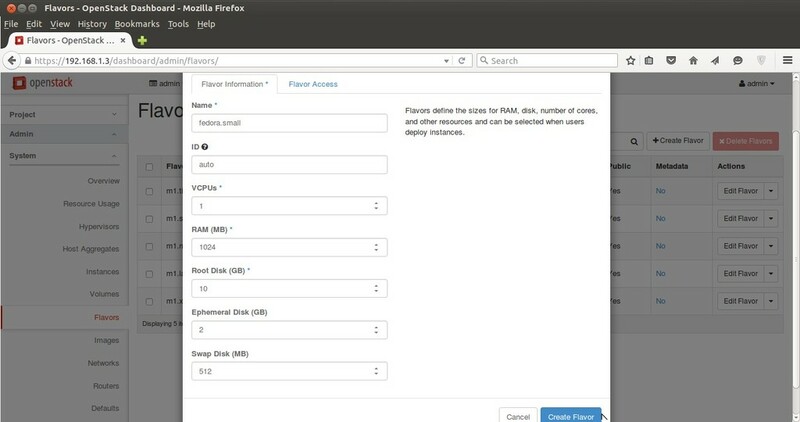 I am able to ping and ssh to the openstack instance but from openstack I am not able to ping the external default gateway and cannot access internet. Can you please help with this issue. I am not able to ping external network its showing router port is down. Thank for the detailed procedure.I have followed your document , everything went fine. But after bringing up the instance i am not able to ping any IP (neither floating nor private IP) . 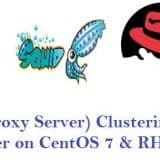 I am using OCATA version, host is Window and using virtual box for guest VM. In Instance when i do console log-in i do not see floating IP .Is it ok? Any direction would be highly appreciated. 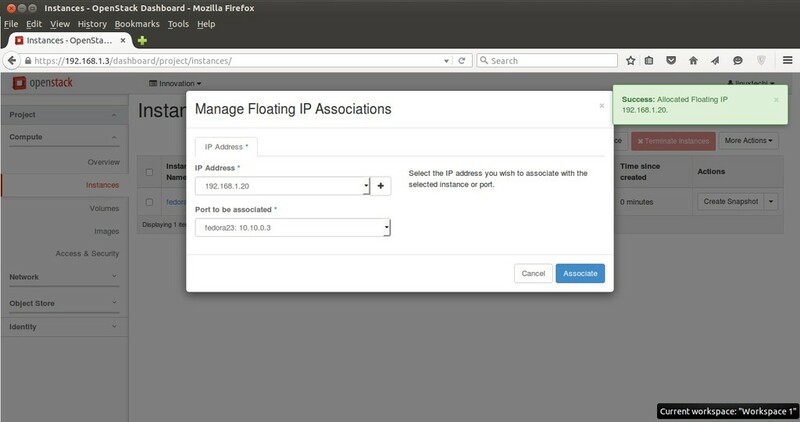 Floating is not assigned to VM Interface but when we associate a floating to a VM then a Nat Rule is written in Firewall in such way that if any request comes to floating IP then it will be redirected to the internal IP of VM. Try accessing the VM with floating IP from the network Node. Hi Pradeep, i’m confused about all the ip addresses you’ve listed there, would you please tell me the meaning and the relationship between these ip addresses, thank you so much. 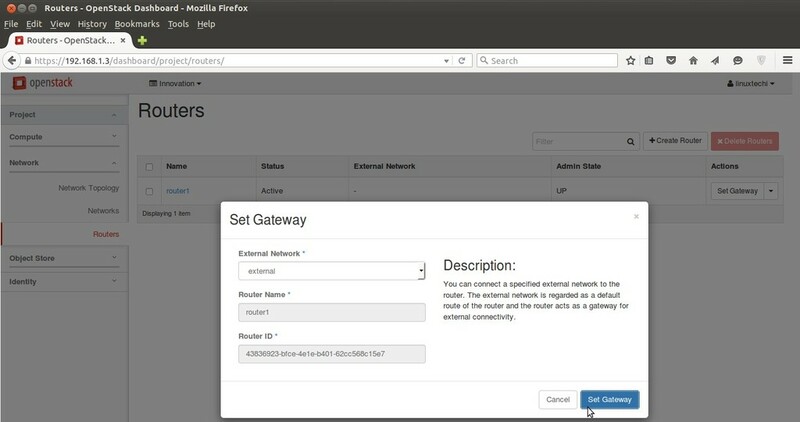 Author is using bridged network for first interface, kind of easy to get the SSH access, but most of you guys have Host only network for enp0s8, and making configuration changes which are meant for bridged network. Build of instance ec4b4174-c0f7-4932-b1e1-45690a462446 aborted: Volume eba07b7d-48a0-4257-bcc7-ef744f532f0d did not finish being created even after we waited 0 seconds or 1 attempts. And its status is error. Jan. 16, 2018, 5:34 p.m.
Can you please help me to find out what is the problem here ? Does adding an image take more than 3 hours to be active ? and thank you for this great tutorial.